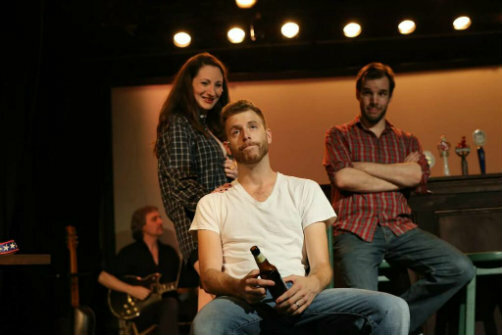 BOTTOM LINE: This musical offers rousing rock-inspired songs and laugh-inducing comedy. In Creative License, a financial crisis leads to the somewhat listless characters finding their path and fulfilling their untapped creative potential. The story, involving a musical within a musical, as well as the zany nature of the material, brings to mind The Producers. The musical opens with Casey (Michael Levesque) being seduced by his cloyingly self-absorbed girlfriend Lilian (Katie Anne Clark). After they’ve climbed of bed, he is subsequently dumped for not being skilled enough of a lover. Casey sings about not having direction in life and then heads off to work at his family bar in Boston, which he co-owns with his brother Jason (Kevin Cirone, who also wrote the show). There Casey and the barstaff sing "What Are We Here For?" wondering just what exactly they are doing with their lives. Then the “steampunk vegan” waitress Candace (Maritza Bostic) discovers a letter stating that the bank is about to foreclose on the bar, which Jason and Casey inherited from their parents. Casey, an aspiring writer, announces a plan to save the bar by staging an original play that he wrote. Problems arise when Casey realizes that he left his most recent script on the laptop of his ex-girlfriend Bethany (Shonna Cirone, Kevin's real-life wife). There is a hate-filled reunion: Casey begs Bethany for his forgotten script, and the two have a sung fight where Ms. Cirone shows off her operatic vocal abilities. However, Casey still follows Bethany to her job working for the professor and playwright Dr. Hardy (Robert D. Murphy), in the hopes of finding a play to produce. Somehow Casey convinces Dr. Hardy to let him direct the playwright's newest "magnum opus"—Macduff, a musical reworking of Macbeth—and Casey convinces the angry Bethany (who must secretly still have feelings for him) to come on as the show’s producer. Unfortunately a snag arrives, and it turns out their script may not exactly be theirs to perform. So rather than opening themselves up to lawsuits, the bar staff decides to stage their own version of Macduff by taking creative license and riffing their own musical. The show's musical numbers are backed by a full band and each performer sings with the skill of a polished Broadway actor, with body mics to ensure that no note or line is lost on the audience’s ears. The numbers themselves are not quite rock and not quite typical musical fare, but more a mix of the two. There is not a lot to the story in regards to character development or substance; what Creative License has a lot of is fun, with actors whose energy and passion for their creation shines through in their performances. The props and scenery of the play give just the right amount of detail (the bar even features beer taps) to evoke each scene effectively. The production is so polished and streamlined that it is hard to believe that these are not seasoned career thespians. (Kevin Cirone also works as a software engineer in Boston). The actors are especially good during the play’s comedic moments, with Clark provoking much laughter as an oversexed narcissist, and with Shonna Cirone's great stage presence in addition to her impressive singing ability. Creative License surely will have a life beyond the Fringe festival (at least it certainly deserves one) and hopefully will stick around New York City for a while before heading back to Boston.